Undercloud is a single node OpenStack installation deployed either in a Virtual machine or in bare metal server. The objective of undercloud is to install, test, manage and update its overcloud servers (Controller, Compute & Storage nodes). In Red Hat terminology undercloud is known as “Director“. Undercloud basically contains all the images that is required to deployed Overcloud Controller, Computes, Swift and Storage. Overcloud is the actual functional cloud for any organization where all the Virtual Machines are created on compute nodes and handle all the workloads. In other words we can say overcloud provides the openstack services like Nova, Keystone , Horizon, Neutron, cinder, Glance, Heat & Ceilometer Services. 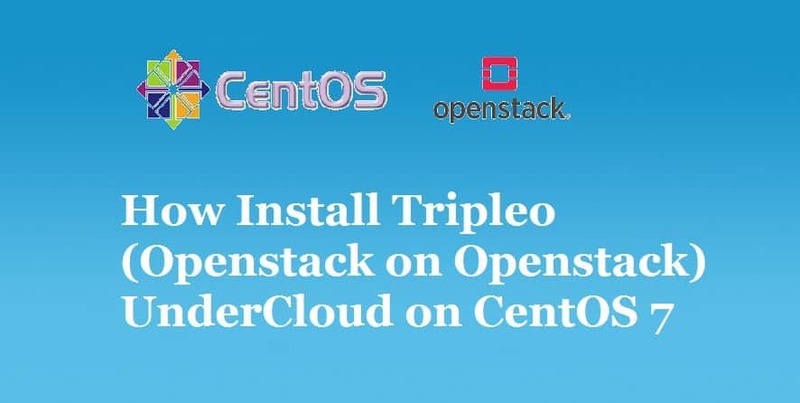 In this article we will demonstrate how to install TripleO undercloud or Director on CentOS 7 VM. CentOS 7 VM (Minimal Installation) is hosted inside the KVM hypervisor. [[email protected] ~]# hostnamectl set-hostname "undercloud.example.com"
Update your system using below yum command and reboot once. Run the beneath commands one after the another to create stack user and assign sudo rights to it. We will install undercloud using stack user only. Execute the below commands to enable and configured required repositories for undercloud installation. This confirms that undercloud has been installed successfully. In the next article we will demonstrate how to import overcloud images in under cloud and how to create inventory file for overcloud servers and then we will see how we can deploy overcloud servers via undercloud. In case this article helps you to understand how to install undercloud on CentOS 7 VM, please do share your feedback and comments. Good one. And also please provide overcloud install and configuration steps..in the next tutorial. nice article. Please publish article for overcloud install and configuration . How to do the step “Two Interfaces are attached to VM (Provisioning & NAT)” in Centos virt-manager ? Please explain network address details. Hello Pradeep, I have some confusion. Could you share about how to create Provisioning & NAT Network on KVM host ? Do physical interfaces need to be attached to the bridges belonged to Provisioning & NAT Network ? And do bridges need to be created with IPs ? Many thanks! After creating the networks, attach these network to undercloud Interfaces via Bridges. hi Pradeep, I have successfully completed undercloud & overcloud installation. Thank you very much! ! And I have other confusions. Thanks in advance. (1) Would it be OK if Provisiong Network not created using virsh net-define and I just create a bridge assigning IP address and then make undercloud & overcloud interfaces attached to the bridge ? if not, why ? (2) When configuring neutron, you know, which overcloud compute node interface should be attached to the bridge that will be configured in ”bridge_mappings = :” in openvswitch_agent.ini ? That means which interface is used to openstack VM network ? Please help me in tackling this error. I was able to resolve this error by adding more memory to VM. I could figure out this on carefully inspecting log which was indicated that its not able to fork the process. failure: repodata/repomd.xml from delorean-current: [Errno 256] No more mirrors to try. I have checked network settings, these added br-ctlplane and docker0 interface, and then original eth cannot have IP address, so can’t connect to internet, please help. Seems there is a problem with repository, i have encountered the below. both are not working. Please do needful. Looks like you need to follow ‘https://trunk.rdoproject.org/centos7-master/current-passed-ci/delorean.repo’ this link each time if you face this issue, as this one contains the latest info. I have modified the delorean-deps.repo or delorean.repo with your repo, but still cannot fix this issue. I just modified the name and base_url line of the file from this article with the lines from the file I linked too. I stuck at this stage, anyone can help?